"I was going through the Russell's insight in the book you [Toby Grotz who obtained a copy from Dr. Tim Binder to donate to Tewari] donated to me. I am convinced that he did have glimpses of reality. He is clear on the inward nature of gravitational force and also on relation of gravity with light. On the more fundamental issue of space and matter his vision that "space creates matter is correct" but when he says that "matter creates space" should read that matter creates "fields" in space. To translate visions into words, in some cases, new vocabulary is needed. In my case it took me two years of deep thinking to write the two simple fundamental equations on mass and charge. How could a void - volume be proportional to mass? The understanding came: that prior to the creation of the void, the volume of space-fluid in circulation at the speed of light (within the spherical void formed later), was enegy proportional to the mass equivalent of this void. Tewari Space Power Generator Home page. See short 10 minute clip from movie Out of the Void showing test results and confirmation by manufacturer. 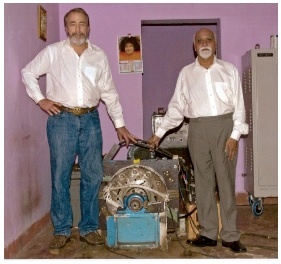 In the film Out of the Void, tests of Tewari’s Reactionless generator are conducted by utility engineers. The over unity test results are then confirmed at the Kirloskar factory where the vice president, factory manager, and lead electrical engineer discuss their replication of the device and over unity test results.